This issue is the end of the two-part Nowhere Man story arc as well as the final story to be told in the present day in Batman, as Year Zero begins in issue 21. This is another amazingly rendered issue by Greg Capullo. His Clayface is menacing. His fantastically detailed visage is freakishly frightening as he twists his amorphous body into an oozing blob of murderous intent, actually swallowing a battered Bruce Wayne in the opening pages of this issue. He is then very unceremoniously spat into a crusher used by Wayne Enterprises R&D Department to eradicate unusable prototypes – he joins a previously deposited Lucius Fox. Fox informs him that Clayface has over-ridden the fail safe protocols and that there is no other way out. All the weapons are gutted before being disposed of, but there hidden beneath a mound of bits and pieces of discarded Wayne-Tech is a concept suit which he Bruce dons to rescue them both. In a nod to Batman Beyond, Lucius explains to Bruce that it will be twenty years before this suit will become cost effective. Bruce leaves in pursuit of Clayface. In the guise of Bruce Wayne, Clayface is leading the Gotham Police on a high speed motorcycle chase. Batman, now wearing a sort of electrified armor, catches up to him and informs him that his blackmail scheme is over. He then attempts to use hydrogen fluoride to thwart the shape-shifting monster – to no avail. Clayface taunts Batman by morphing his fingers into grotesque puppet-like versions of The Joker, Penguin and Riddler. Batman tries solvent, coolant – anything that would have worked on the old Clayface. Nothing works so then he resorts to electricity – he charges the suit and releases every ounce of power he can generate into Clayface. This does nothing more than tingle the hulking villain. He grabs Batman by the head, crushes the face mask of his helmet and makes contact with his skin just as Commissioner shows up with a squad of police officers. They hold their guns on Clayface and he transforms again into Bruce Wayne. Clayface now believes he has uncovered Batman’s secret identity for all to see. Since making contact with Batman’s skin should have allowed him to become whoever he is under the mask. However in the confusion, Clayface is trapped in a panic chamber that has been programed to respond to the only person Batman can be sure that Clayface cannot duplicate the DNA of – Basil Karlo. It seems that in becoming everyone he touched, Basil Karlo had lost his own genetic code thus, making himself a cipher, a perfect clay man. Batman explains that he was wearing a fiber mask of Bruce Wayne’s DNA, which is the reason he became Wayne after touching him, once again preserving his secret identity. This angers Clayface so much so that he takes on the likeness of Damien Wayne and rages against the rich like Bruce Wayne and their disregard for everything including his own son. Batman is still raw from his loss and flies into a blind rage, kicking the panic chamber containing Karlo who is still maintaining the image of Damien. Batman is recounting the capture of Clayface to Alfred back at the Batcave. Alfred has just finished wrapping Batman’s most recent bruises, when he joins him for an evening of reminiscing about his lost son. In an extremely poignant and tender moment we see a single tear stream down Bruce’s cheek as he watches the view screen inside his visor. This was an extremely well written arc. Scott Snyder kept the possibility of Batman’s identity being exposed just out of reach for the entire story. The suspense just added to the excitement of an already pulse-pounding plot. 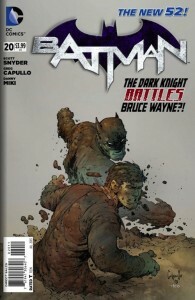 Snyder re-invents Clayface as a more powerful, far more formidable foe. This was a nice send off before Year Zero starts next issue, which will tie things up for the next eleven months. I could read Scott Snyder’s dialogue forever – it is so good that I find myself quoting it as one might do from a favorite film. Let’s move from some of the best writing in comics to talk about some of the best artwork in comics today. Greg Capullo is unbelievable at drawing horrific monsters – just look at his work on Spawn and Haunt. The amount of detail he puts into his creatures is what makes the difference. His Clayface is not just a blob but a layered mass of crust and teeth and muddy goo, something truly disgusting and awful to behold let alone to be swallowed by. I can only call to mind the words of Han Solo when he commented about a freshly opened taun-taun, “And I thought they smelled bad on the outside”. Just imagine what Bruce Wayne endured while inside Clayface. I’m sure it was an assault on all senses, and Greg Capullo brings that so sharply into focus that you can almost smell the dank musty mud. His artwork is second to none and his work on Batman is some of his best. The back-up story written by James Tynion IV, with art by the great Alex Maleev, is also brought to completion here. It’s not an Earth shattering epic but just a nice Batman/ Superman team-up story. The two heroes battle a supernatural entity called Will O’ The Wisp. The end of the story shows us a moment of deep friendship and the effects of Batman’s loss on that friendship. Ultimately that’s really what this story is, a glimpse of a deep friendship. 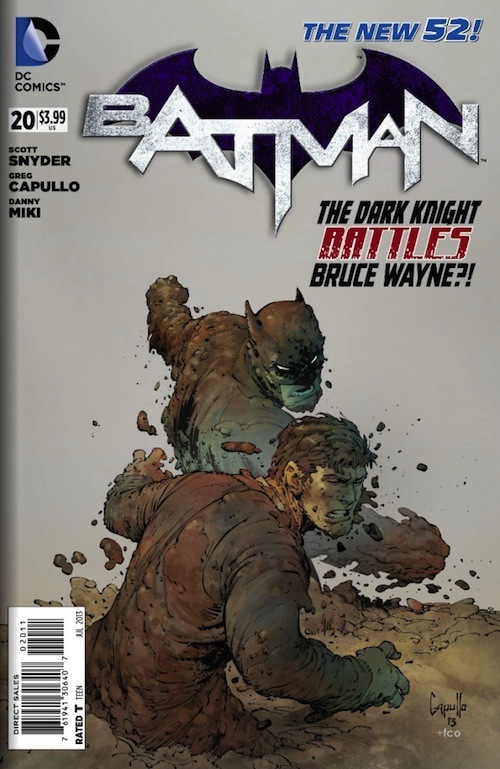 Batman #20 is an all-around top-notch comic book with fabulous writing and fantastic art. If you are not currently a regular reader of Batman you might want to take the upcoming Year Zero event to jump on. You will be happy you did, trust me.